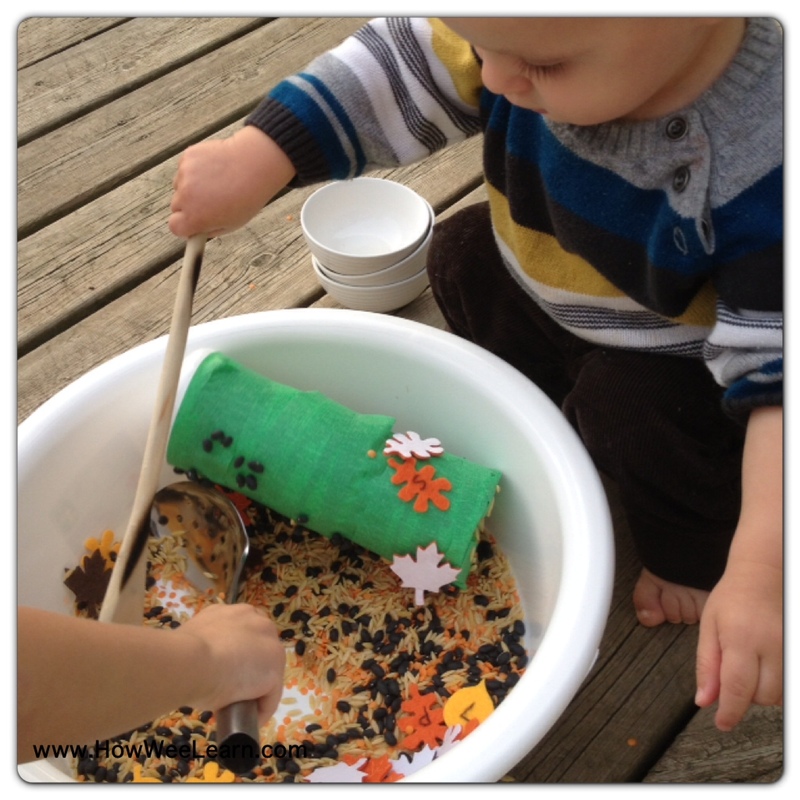 There are so many wonderful Sensory Play ideas! For this Halloween Sensory Play activity, I combined two ideas that I love – providing Sammy and Benjamin with a Sensory Invitation to Play! Best of all, the bin took me 2 minutes to put together and the boys have been enjoying it for days. 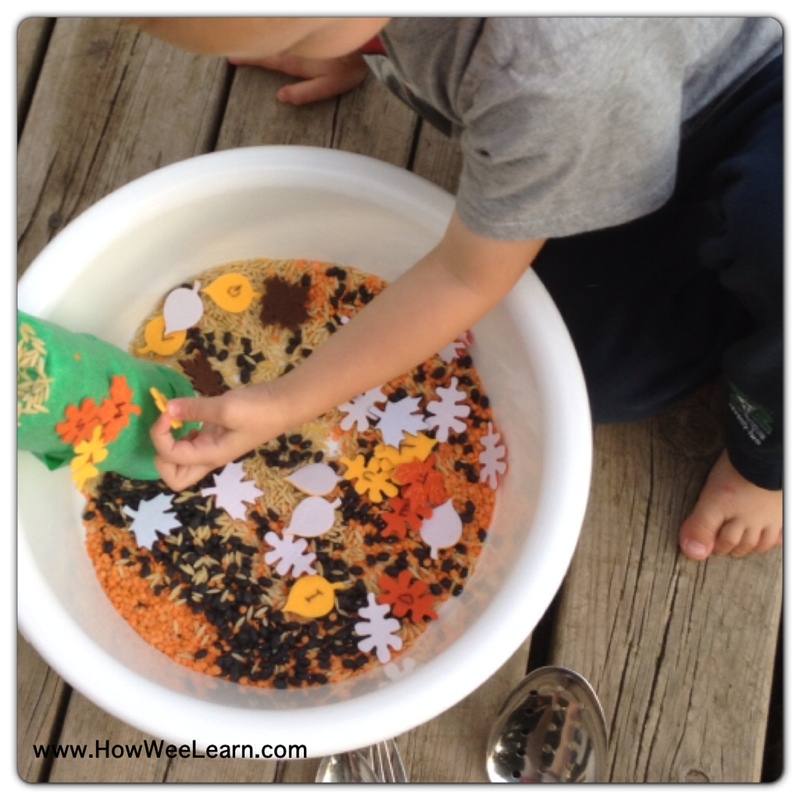 I began by making a Sensory bin with some Turtle Black Beans and Crushed Red Lentils (which are a beautiful Black and Orange) from the Bulk food store. I used this idea after seeing the beautiful Sensory Whole Spices Play Ann created at My Nearest and Dearest. Next, I created a Sticky Tree very, very simply by wrapping painters tape (sticky side out) around a tall plastic container. This idea is similar to Stephanie’s Sticky Tree Invitation to Create at Two-daloo. I added felt letters which I had written alphabet letters on. I introduced this Sensory Play activity to Sammy with all of the items separated into bowls. I thought he could explore each item individually, or choose to mix them. Sammy decided to mix the items almost immediately 🙂 And, at this time of the dumping, I decided we should head outside. Sammy enjoyed feeling the beans and lentils – sinking his hands into the bowl again and again. It was a nice quiet way for him to play after his rest. Sammy discovered the stickiness of the tree and started adding his leaves. He would use the big slitted spoon to hunt for ‘his letters’ (S A M) and put them up on the tree. He added some other items to the tree as well. 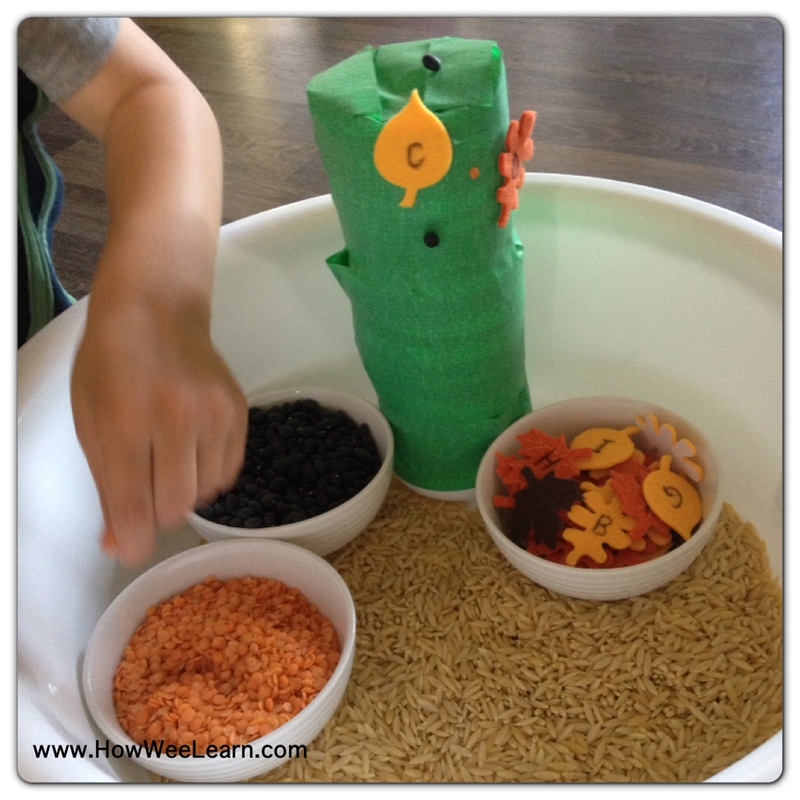 Benjamin woke up from his rest time and I decided to let him have a (very supervised) turn with this Halloween sensory play activity. Ben just turned 1 – so he is still prone to exploring with his mouth – but I thought he may be intrigued by the spoons. And he was, for a little while anyways! We have used this Sensory Play activity frequently over the last few days. The sticky tree was replaced by tin cans – which the boys loved too. 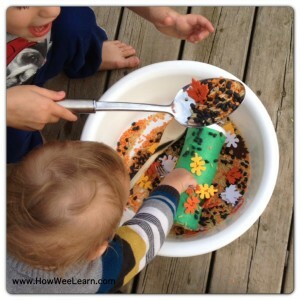 Activities like theses are a great calming activity for Sammy. A nice way for him to wake up after a rest, or settle down before one. 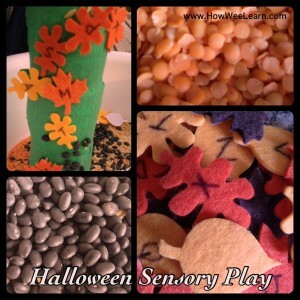 I will be popping this sensory play away for a week or two and then adding some spiders and little pumpkins for some really Halloween-ish fun! 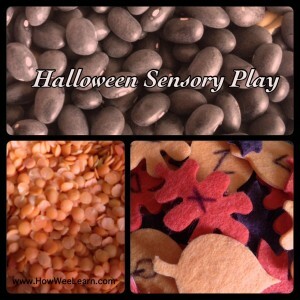 Any ideas for what I could add to this Halloween Sensory Play Activity? You must love shopping at the Bulk Barn… yes there should be everything there that you might need.. love the lentils and the brown bean mixture. Thank you for your comment! How do those wee toes look up close, may I ask? I have just been using my phone for pictures (so convenient, little and I always have it on me!) but I am thinking of perhaps making the switch to a real camera. How is the quality do you find? Thanks for any input! This looks like so much fun. 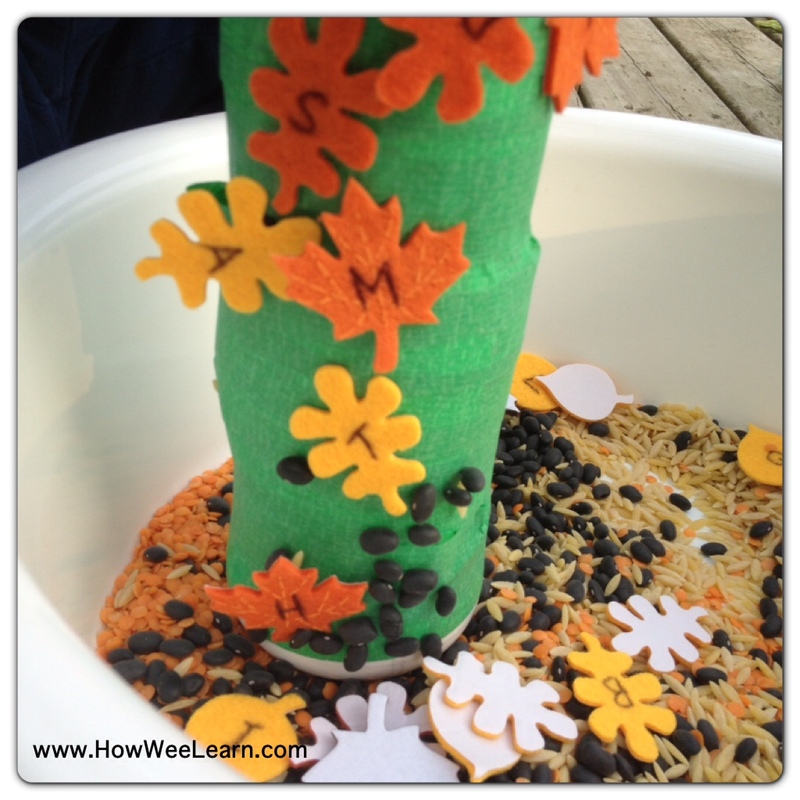 I love that you combined the bean based sensory bin with a sticky tree. Great idea!